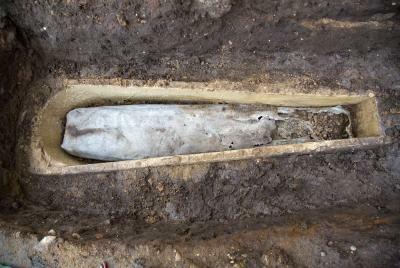 University of Leicester archeologists lifted the lid of a medieval stone coffin near the final resting place of Richard III this week - and found a mysterious coffin-within-a-coffin. This is their second dig at the Grey Friars site, where the medieval king, one of the most infamous in English history, was discovered in September, and the first fully intact stone coffin to be discovered in controlled excavations. It is believed to contain one of the friary's founders, or a medieval monk. Within the stone coffin, they found an inner lead coffin – and will need to carry out further analysis before they can open the second box. So they have taken the inner lead coffin to the University's School of Archaeology and Ancient History, and will carry out tests to find the safest way of opening it without damaging the remains within. It took eight people to carefully remove the stone lid from the outer coffin – which is 2.12 meters long, 0.6 meters wide at the "head" end, 0.3 meters wide at the "foot" end and 0.3 meters deep. The inner coffin is likely to contain a high-status burial – though they can only guess who it contains. The individual's feet can be seen through a hole in the bottom of the casket. The archaeologists suspect the grave could belong to one of three prestigious figures known to buried at the friary. These include two leaders of the English Grey Friars order - Peter Swynsfeld, who died in 1272, and William of Nottingham, who died in 1330. Records also suggest the friary contains the grave of 'a knight called Mutton, sometime mayor of Leicester'. This may be 14th century knight Sir William de Moton of Peckleton, who died between 1356 and 1362. However, many other people, now nameless, were also buried in the Greyfriars church - so the identity of the person inside the coffin may never be known. 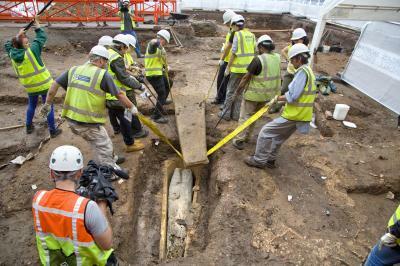 The archaeologists discovered the coffin during the first Grey Friars dig in September, but weren't able to investigate it further at the time. Grey Friars site director Mathew Morris, of the University of Leicester Archaeological Services (ULAS), said, "The stone coffin was always the big thing we wanted to investigate during this dig. For me, it was as exciting as finding Richard III. We still don't know who is inside – so there is still a question mark over it. "None of us in the team have ever seen a lead coffin within a stone coffin before. We will now need to work out how to open it safely, as we don't want to damage the contents when we are opening the lid. "The coffin could contain William de Moton, Peter Swynsfeld or William of Nottingham – who are all important people. Swynsfeld and Nottingham were heads of the Grey Friars order in England."